For a unique, one of a kind gift, consider the purchase of a cast bronze or marble art piece by Richard Summons, local award-winning artist. Stop by the shop to see some of his pieces for sale. We carry many special and unique gifts that surprise and delight. From chic leashes and collars for the dogs to handcrafted dog purses for you, you’ll find something to love about Godfrey’s. And the best thing is that new products arrive weekly...you never know what you're going to find! And if you don't see what you're looking for, please ask. Leisurely walk through all of the rooms in "our house": the Living Room, the Whining and Dining room, the Bedroom, the Out-N-About room and the Bathroom/Spa room…each room decorated and filled with fun and exceptional products. 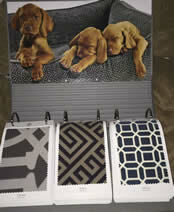 When was the last time you bought something that looked good on your dog and reflected your sense of style? Outfit your best friend in a chic collar and leash or apparel from Godfrey’s. 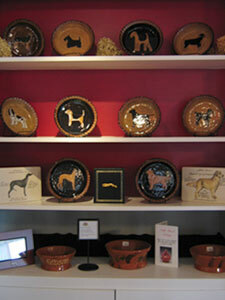 From sweatshirts, tiles, coasters in your favorite dog breed for the humans, to leather coats, handknit sweaters, dining stations, gourmet treats, and intelli-toys for your great canines, you'll find the unique and unusual at Godfrey's. No need to travel to New York or California boutiques to find the latest and greatest products for your furry kids; we've got it all here! More about products. Good looking, high quality toys that actually look good in your home! Our handcrafted items are unique and one of a kind. For some of our lines, we do take custom and special orders. Just ask us! Ever celebrated your dog's birthday? Chances are you have and you will continue to do so. No need to keep it a secret any longer! Statistics indicate that over 60% of families with dogs have canine birthday celebrations of some form or another. We've got some nice goodies to help you out..."pawty" invitations and thank you notes, large "Happy Birthday" gourmet biscuit bones, birthday cakes, "Happy Birthday" cigar biscuits, hats, candle holders and fun and fancy neckware. For that next birthday, invite some friends, both canine and human, and watch the fun happen! "Comfy Dog" oatmeal conditioning shampoo for dry, itchy skin. "I Don't Stink So", a product to freshen places where "sleeping dogs lie"; it's formulated from lavender, lime, mint and distilled water. "Bow-Wow Butter Balm", wonderful for soothing cracked paw pads and for relieving soreness between the toes. 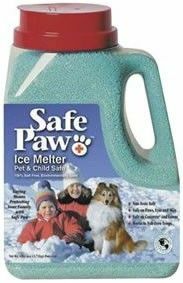 irritate your dog's paw pads or upset the stomach if paws are licked. ...and many, many more products! 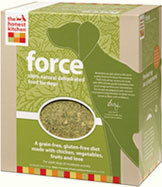 Wellness supplements and natural products from Ark Naturals can enhance the quality of life for your dog. NEEM Protect Shampoo and Spray are great for keeping fleas, ticks, insects and mosquitoes away from your dog. "Flea Flicker" (clever name) also helps keeps fleas off of you and your canine as does the product from Happy Tails called "Flea the Scene." We also carry fabulous products by Herbsmith. Their five mixes are composed of the finest chinese herbs. 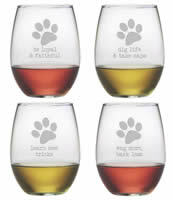 The company was founded by a veterinarian in Wisconsin who is also uses holistic methods and products in her practice. She is a certified acupuncturist and herbalist. One product, Clear AllerQi, has been helping many of our dog customers who suffer from seasonal, environmental or food allergies. We feel great knowing that we are helping dogs stay off of prednisone! They have a great product that helps with joints, another for building immunity, one for calming an anxious dog and another to be used when recovering from an injury or trauma. Check out the flower and herbal essences we have in our spa room by Botanical Animals. These natural products help your dog deal with various issues. The most widely used of these products in our shop is "Mellow Out," used to calm dogs dealing with anxiety in thunderstorms, during fireworks and other stressful situations. For aid in digestion, check out OptiGest, made by InClover and Gentle Digest by Ark Naturals. OptiGest helps the body build up prebiotics and enzymes in the gut, creating the environment for beneficial bacteria to grow. Gentle Digest provide probiotics and prebiotics. For joint health, try Connectin by InClover or Joint Rescue Remedy and Sea Mobility treats by Ark Naturals. Our customers are VERY happy with the results. They report that their dogs are running and jumping again; they truly are amazed with the results they are seeing in their dogs. You can stop shedding, itching, scratching, dull coat, dry coat, dry skin and regrow a healthy new coat of your dreams for your canine when supplementing the diet with a high-grade oil like Laske Kronch wild salmon oil or Dr. Harvey's Health and Shine capsules. And remember to check your shampoo ingredients, too, for the use of natural, environmentally friendly ingredients. Stop by and read about these terrific products and many, many more, all carefully selected by our owner. Start today using natural, environmentally friendly products for your dog! Your dog is your companion, friend and a trusted family member. We know that you want your dog to eat well. That’s why we offer only natural dog foods that provide superior nutrition – whole meat protein, whole unprocessed grains, vegetables, and fruits. We read labels and compare ingredients. And the foods we select contain no artificial preservatives, colorings or flavorings, wheat, corn or soy. And, according to our customers (the dogs, of course), the foods taste great, too! As a personal commitment, we only sell food we would feed our own beloved dogs. Evanger's canned meats - canned in their own facility in the U.S.
Grandma Lucy's Freeze-dried raw food and treats; limited selection of formulas. Call for availability. The Honest Kitchen Dehydrated Raw Food, using organic grains, hormone/antibiotic-free meats and non-GMO produce. All ingredients are guaranteed 100% Human Food Grade. Mix up your own homemade food yourself! Vegetarian mix also available. Sojourner Farms (Sojos) - Simply add meat and water to one of their natural dog food mixes and you've got a fresh, homemade pet food in minutes. Vegetarian mix also available. Weruva canned dog food; cat food by request. Special orders processed bi-weekly. Nature's Logic-Dry and Canned. Special orders processed weekly. Bravo Homestyle Complete. Call for size and flavor availability. Special orders processed weekly. Raw Frozen Foods-Limited Selection in all brands - Call us at 610-777-5755 to be sure we have what you need, and if not, let us order it for you! We order regularly from the distributors for these lines. If there is a raw food other than these listed that you are interested in, please call us and we'll be happy to work with you to bring it in! Northwest Naturals, Stella and Chewys, Aunt Jeni's and others. Just ask us and we'll see what we can do! Healthful, delicious treats include: Wilderness venison and beef jerkies, My Doggy™, Cloud Star treats, Bravo freeze-dried treats, Real Meat treats, Grandma Lucy's, Laske Kronsch Salmon Treats, K9 Granola Factory treats, Himalayan Chews, Antlers, Fruitables, and many, many others. Stop by the shop, talk with us about your dog’s nutritional needs, take home some free samples, then select one of our superior foods for your best friend. Note: You'll find our foods and treats in our kitchen. Obvious, eh? We store most of our inventory downstairs on racks, so if you need larger bags than what you see on the kitchen floor, just ask us and we'll get it for you! We also carry dry foods from Fromm, Orijen, and Acana and canned cat food from Weruva, Fromm Applaws pouches and Fussie Cat. Cats are part of dogdom, you know! 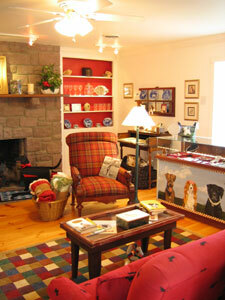 Come visit our shop in the beautiful countryside of Berks County. so make a day of it! Directions to our shop. Hours: Tues.-Fri. 10-6 Sat. 10-4 Sun. 11-4 Closed Mon.